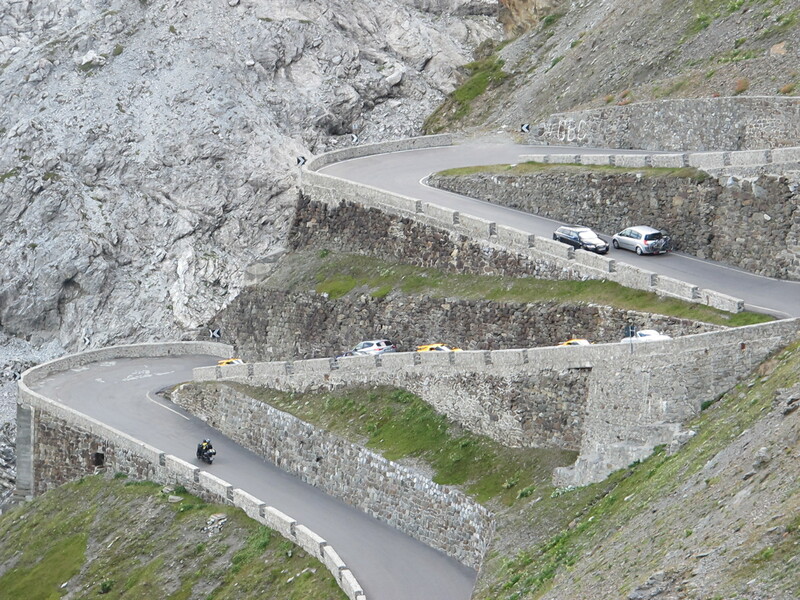 Those of you who are Top Gear fans will remember that Clarkson and company declared the Stelvio pass the best road ‘in the wooooorld’ until they discovered the Transfagarasan road on their visit to Romania. 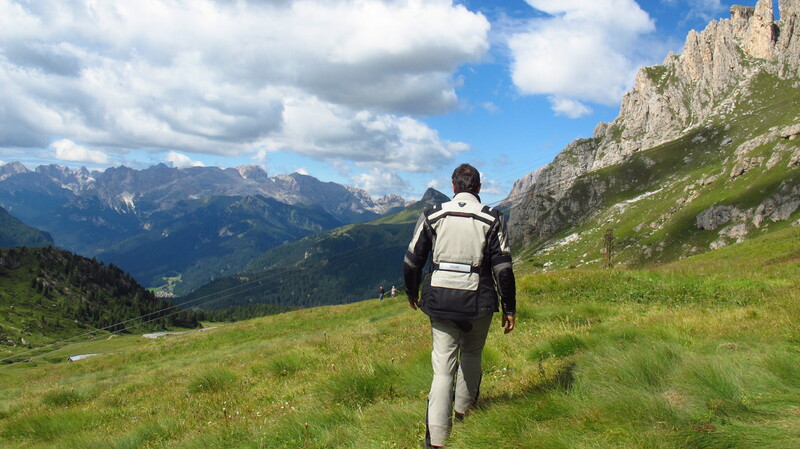 I had the privilege of riding that road almost two months ago and I completely agree with them – it is an amazing ride and a must for any bikers riding Europe. Today, however, our route back home was going to take us across the Stelvio and I was eager to see how it compared with the Transfagarasan and whether it deserved that second place. I was very excited at the prospect of riding another legendary road, what I did not know was that the two days it would take us to get to Interlaken were going to be a feast of absolutely marvelous mountain passes that would make it very difficult to come to a conclusion and chose the best one. I had bought a good old paper map of the Alps in Slovenia which had a lovely level of detail, and we were going to use that to navigate for the next few days, using the GPS only as extra help to get from one waypoint to the other and programming it on the way, as I did not want to depend on whatever route it might decide from A to B and miss on some great roads. We rode out of Cortina under a glorious blue sky, my allergy all but gone, and were soon climbing a pass called Di Sella. The tarmac was in excellent condition, there was not much traffic aside from other bikes and the road wound its way up the pass through lush fields of green, a combination of fast corners at the bottom and hairpins at the top. It was here that I saw for the first time that Italians number the corners on their mountain passes, so can count how many you have to go. 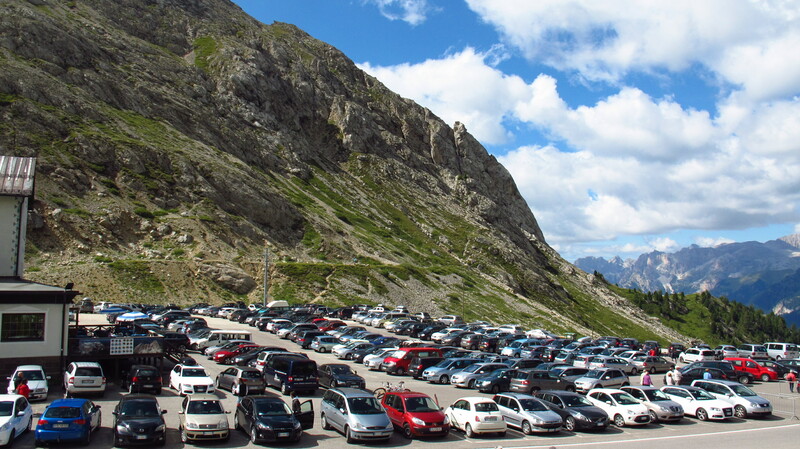 We stopped at the top of the pass, where there were hundreds of cars parked. It was clear that it was the starting point of many hiking and climbing routes, and the place was crowded. Luckily, we were able to just park the bike next to a couple of GSs right by the road and decided to take a short walk up the mountain to enjoy the views. Nat was feeling a bit cold after the ride in the morning air, but a brisk hike up a mountain trail dressed in bike gear soon warmed us up. After taking a few pictures we got back on the bike and rode down the other side, which turned out to be even better. Rides like this put all other roads in perspective, and once we were down from the mountain pass and going to Bolzano, what might have been a decent road felt like the dullest thing in the world. We went past the city, took a short stretch of free motorway to Merano and then got back on a B-road again, heading for the Stelvio. There were about 50km to the point where the road leading up the pass started, and the traffic was quite heavy. To make matters worse, there were not many overtaking opportunities, at least not legal overtaking, so I was starting to worry. We passed several trucks easily, but what I did not like was the fact that there were quite a lot of motorhomes on the road. I assumed that trucks had no reason to take the Stelvio, but I was afraid that the tourists crawling along on their motorhomes might want to visit it, thus completely ruining the experience for all the enthusiasts riding bikes or driving sports cars that might end up stuck behind them, chugging up the road at 20km/h. 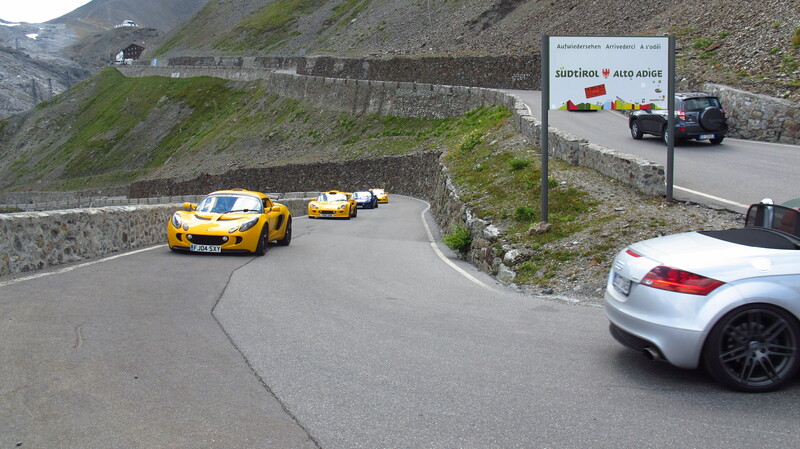 Overtaking as many as I could on those last 50km before the Stelvio, I could not help but to agree with Mr. Clarkson. A truck might be slow, but at least it is performing a service to society, a caravan is just a moving obstacle on the road driven by someone who is too good to sleep on a tent but too mean to pay for a hotel. And not even that, those things, especially motorhomes are expensive, why not just buy a decent car, enjoy a good drive and spend the difference in a hotel!? Anyway, by the time we got to the junction, we had left all of them behind, and we had a clear road ahead of us. After passing a couple of towns I was very pleased to see signs limiting the length and weight of the vehicles allowed up the pass, which meant that there would be no caravans, motorhomes or tourist coaches blocking our way. Great! I dropped a couple of gears and leaped for the first serious corner. What a ride! This was a very different place from the Transfagarasan – one hairpin after the other, I had to take them in first gear, using the whole width of the road to carry enough inertia to keep the bike from falling over or stalling. Remember, this was no sports bike, but a fully loaded adventure tourer with two people on it. In spite of that, it performed admirably, roaring its way up the road and, surprisingly, keeping up with much more powerful machinery. Nat did a beautiful co-piloting job, looking up the road as we approached each corner and letting me know if the way was clear for me to use all the available tarmac, and the odd slow car was quickly overtaken between hairpins. Oh, and talking about slow cars, I felt really, really sorry for a convoy of gorgeous Lotus Elises that spent the last part of the way up helplessly stuck behind a RAV4 driven at 10km/h by a family of tourists who looked absolutely terrified at the corners. There were hundreds of bikers at the top of the pass, and while the GS seemed to be the machine of choice (there are thousands of these things everywhere!) people had ridden up here in all kinds of things, including an old woman on a classic Vespa. I bought a Stelvio pass sticker to put on the bike and then sat down to have a rest and ponder whether this was better than the Transfagarasan or not. The landscape was no doubt amazing, high rocky mountains covered in snow, deep valleys, lush pine forests at the bottom… but the corners were too tight for my taste, at least on the eastern side, which meant that the riding was less enjoyable than in the Romanian road, which had faster corners. This was all first and second gear. 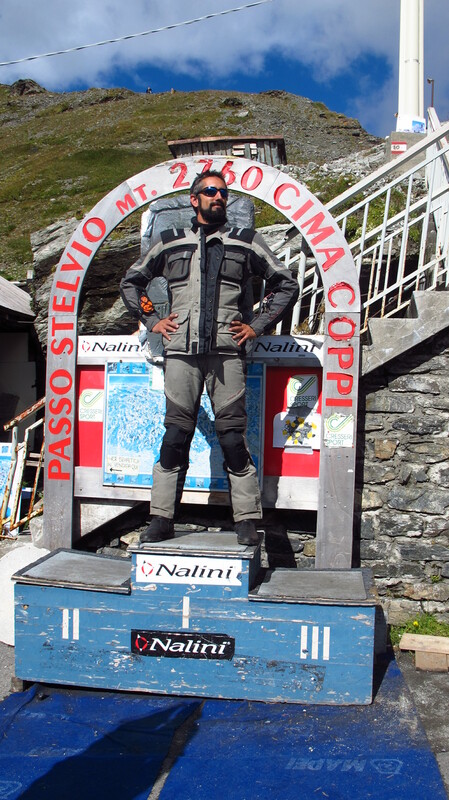 Of course the Stelvio is a well-known name for riders in Europe, and there is something magic to it, but that fame has a price, which brings me to the second reason why I prefer the Transfagarasan. 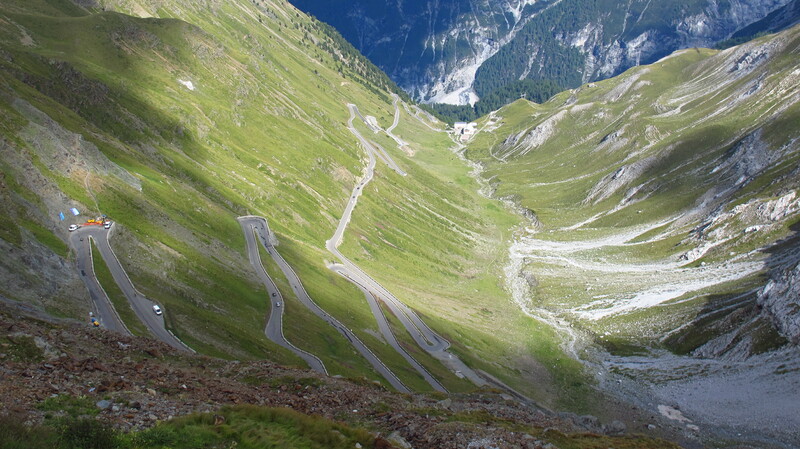 Unlike the Transfagarasan, the Stelvio attracts a lot of people, which is OK as far as bikes and sports cars go, but there are also a lot of people driving very slowly on it, which spoils the experience if you are stuck behind one of them for a while. Finally it also suffers from the same problem that affects all great driving roads in Western Europe – cyclists. Hundreds of them, fantasizing they are wearing the maglia azzurra in the Giro. There is virtually no traffic on the Transfagarasan other than a few enthusiasts, and that is reason enough for me to agree with the boys from Top Gear and rate it above the Stelvio. To be completely fair, I have to confess that we did not ride down the other side of the Stelvio, so my impressions might be incomplete. We were heading for the Davos area, so once at the top, we took a smaller road that went down the northern side. It was great – no traffic, faster corners, beautiful scenery, and it even had a bit of adventure riding factor, as halfway down the tarmac disappeared and it became a dirt track for the rest of the ride. It was quite funny to see the faces of some guys on sports bikes and a couple on a Porsche trying to make their way up the pass! Once in the valley we started looking for a campsite, but there was only one in the area and it did not look very nice. Add to that that the night was going to be quite cold up there and we decided to ride to the next town and try to find a room to rent or some kind of B&B. It turned out she lived in a big old house round the corner and she had done up a room in the ground floor to rent to tourists. She made us a very good deal, so we parked the bike in her garden and spent the night there. It was much, much better than we could have hoped for. The room was big and cosy, the bathroom was almost as big as the room and best of all… the floor was heated. It was better than many hotels I have stayed in. 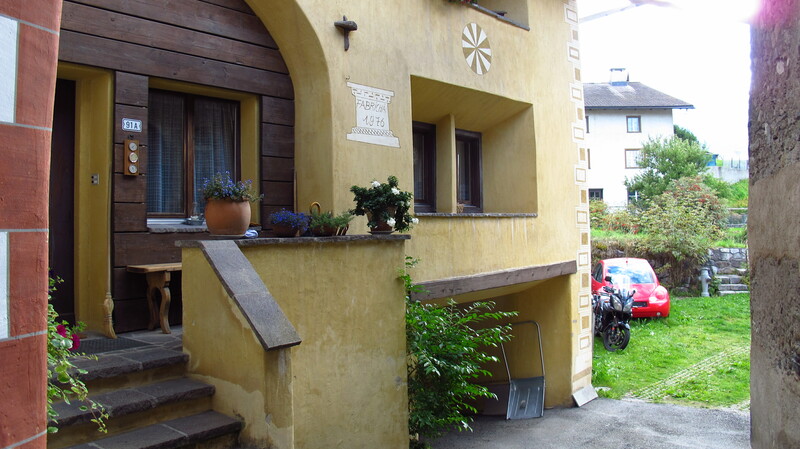 This entry was posted in Stroming The World 2013, Travel and tagged Cortina d'Ampezzo, Italy, Santa Maria, Stelvio Pass, STW 2013, Switzerland by Kilian. Bookmark the permalink.